My Point of View and Inventions and Dimensions found Herbie Hancock exploring the fringes of hard bop, working with a big band and a Latin-flavored percussion section, respectively. On Empyrean Isles, he returns to hard bop, but the results are anything but conventional. Working with cornetist Freddie Hubbard, bassist Ron Carter, and drummer Tony Williams — a trio just as young and adventurous as he was — Hancock pushes at the borders of hard bop, finding a brilliantly evocative balance between traditional bop, soul-injected grooves, and experimental, post-modal jazz. This is a quartet album for trumpet and rhythm section. In this circumstance, a problem was created for the composer-arranger, in that the lack of another instrument supporting the lower, richer register, such as a tenor saxophone, might result in a shallow sound. With this problem in mind, Herbie Hancock, who composed and arranged all the tunes, wrote them to sound more like improvisations than ensemble melodies, so that the warmth and fullness of a supporting instrument would not be missed. Free sketches were written in such a way that each instrument is allowed great flexibility of interpretation. In many cases, no melodic line was laid out over the chords nor atonal clusters written, so that the trumpeter could supply any melody he wished. “The Egg,” the most exemplary composition in the album, has only a short trumpet melody written out over a repeating figure in the rhythm section. This sets the mood and builds up tension; after that, the musicians’ ears do the rest! Away beyond the mountains of Lune, in the heart of the Great Eastern Sea, lie the Empyrean Isles, four glittering jewels, beyond the dreams of men. There is a perpetual haze around them, shimmering and distorting, and they seem to hover, ethereal, a little above the water, suggesting a world inaccessible except to fancy. Myth and legend clothe these Isles in mystery, for they are elusive and said to vanish at the approach of ordinary mortals. Yet sailors have seen them glinting from afar, a green and gold illusion. Warm winds caress them, wrapping sinuous tendrils of mist around their lofty crowns and wafting a delicious scent across the waters, fresh, yet heavy, strong and intoxicating. Thus it is said that incense-bearing trees blossom there, filling the air with the frail, intimate perfume of flowers unseen in the dark. No man has ever been known to set foot upon their shores, but ships have passed close enough to glimpse, through the enfolding mists, the slender stems of bright trees swaying in the breeze, and near one of the Isles, to catch the lush, overpowering odor of ripe cantaloupes. Men say this island is covered with leafy green vines, and cantaloupes are everywhere. Nothing else grows, there, and flourishing thus unchecked, the vines and melons attain enormous size. It is said that a mere mouthful of one of these cantaloupes will give immortality to him who eats it. On clear, windy days, when the breezes are strong enough to dispel the vapours, it is possible to discern the smooth, shining, dome-shaped peak of The Egg, a mountain about which the strangest mists and tales are woven. Veiled, inscrutable bastion of strength, its silent presence suggests ever-present danger, dormant perhaps, but ominous in its potential. And occasionally, when some vast tremor from the bowels of the earth shakes the waves and sends towering mountains of water across the placid Eastern Sea, people say that The Egg is ripening and becoming impatient at its long confinement. There are many tales and prophesies concerning the hatching of The Egg. No one really knows what may emerge. There are those who scorn the magic of the Isles, saying that if The Egg ever breaks open, molten lava will gush forth, as is the case with the mountains of our ordinary earth. But those who have seen the Empyrean Isles and have passed within the circle of their power believe other and stranger things. Some say that a vast monster will rise, perhaps a dragon, breathing smoke and flames. Others say a new island will be born. And lastly, there are those who believe that The Egg is angered by man’s interfering ways, and its eruption will herald the passing of the islands from our sphere, remaining no longer as a living paradise for men to gaze upon. Yet the island that has fascinated men more than any other is the Isle of Dreams, containing the mythical Oliloqui Valley. Men passing close to this isle become transfixed, all their senses bending toward it, oblivious to the world about them until the winds carry them out of the ring of power. Their minds and voices are far away, as if they walked in some dark vale, lost between dreaming and waking. When their thoughts return to the land of men, they babble in unknown tongues and tell of weird visions, of far countries and strange peoples. Always they speak of dancing, of a beautiful and complex dance they can only describe as the “One Finger Snap,” which they say they do in their dreams, but which they cannot duplicate afterwards. Yet it is ever with great reluctance that they turn their minds away from these glittering fantasies. They speak of wandering through a far valley ringed about with frowning precipices and filled with the perfume of large, white flowers, pale and deadly. There are great swaths of filmy moss hanging from all the trees, creating an illusion of a veiled mystery, but when the elusive barrier is thrust aside, there is only another. In their dreams, men keep parting the veils, thinking they are reaching the heart of the mystery and wandering further and further till they are lost in a shadowy world where dream and reality lose their distinction. One ship became becalmed within the circle of this isle, and the men remained too long wandering in its secret enchantment. When the wind finally came up and drifted their ship back to the world of men, all the sailors were found dead, their eyes closed and peaceful smiles on their faces, as if they had dreamed to death. This introduction [see original album liner notes] is probably by Duke Pearson, who wanted to explain this record. The record was called Empyrean Isles (BN-4175) and the music was based on the images that Nora Kelly’s story evoked in Herbie’s mind. I asked Herbie if he envisioned a title or mood of a piece before he composes, and he said, “Only when I’m finished and satisfied with the results does the title come to mind.” The 19th-century model for composers was for a story to have musically connected thematic material. Herbie decided that each piece should sustain it’s own mood and individual character. And the fact that three of the compositions have become jazz standards is a true testament to their individual strengths. “One Finger Snap” is a four-measure gesture that is designed to “get to that place” as Herbie put it. Freddie Hubbard’s solo from measures 5 thru 16 has been incorporated into most versions of this song, but the original melody is only measures 1 thru 4. The alternate take of “One Finger Snap” is one of the rare exceptions where, save a few fluffs, it is superior to the issued original. Freddie and Tony hit it off on the alternate and exploded. What kept this in the vaults was that Herbie had dropped two measures in his first solo chorus, making what is known as a mistake, even though the band makes the most out of it. This quickness to respond to a displaced measure or two was the result of many hours working together. “Oliloqui Valley” is a short-form piece (intro-8-4-8-8), that goes from a nice even groove into a swinging 4/4. The alternate is cool; a nice performance. “Cantaloupe Island” has legs. The track was somewhat popular in the mid-60s, but it was not until the Hip-Hop band Us3 sampled the track and incorporated it into their mega-hit “Cantaloop” that anyone really took the song seriously. The tune is simple enough; 4 bars of F minor, 4 bars of Db7, 4 bars of E minor and a 4-bar return to F minor. The groove is defined by a funky, ostinato pattern that Herbie sets up and doesn’t change. This pattern gives the tune its grounding, and makes it easy for Freddie to sound funky. It is by far one of Herbie’s most popular tunes in today’s jazz scene. On July 2, 1964, Herbie made his last session with Sonny Rollins (with Cranshaw and Mickey Roker on drums) for RCA. “Winter Wonderland” and “When You Wish Upon A Star” stand out as quality Herbie performances. Four days later (July 6), Herbie participated in a Blue Note recording session with his friend Grachan Moncur III with Wayne, Cecil McBee and Tony Williams. The music was open and improvisational. During the summer, George Coleman left the Miles Quintet and Sam Rivers joined the band. On July 14, 1964, a few days after the Moncur date, the Davis Quintet was in Tokyo, Japan, and the concert was recorded and released by CBS-Japan as Miles In Tokyo (CBS-Sony 60064). The Quintet returned to the US and began a gig at Birdland. On August 5, Herbie was on the Jackie McLean Blue Note session released as It’s Time, (BN-4179) and along with Herbie, Roy Haynes was featured. It marked Charles Tolliver’s recording debut. Three weeks later (August 24), Herbie recorded two tracks (again for Blue Note) on Tony Williams’s debut recording Lifetime (BN-418O). This recording reunited Herbie with Bobby Hutcherson. Miles hired Wayne Shorter after Sam Rivers left, and a new chapter in jazz history was about to be written. After making their American television debut on the Steve Allen Show (which aired on September 22nd and 25th), the Quintet embarked on a two-week European tour. Many concerts were recorded (and released recently on CD), and CBS-Germany released Live In Berlin (CBS-62976) from this tour. Soon after the Quintet’s last European concert, Herbie was back in the US and in the studio for a session released on the Verve label. It was for Donald Byrd, and the record was called Up With Donald Byrd (Verve V-8609). On October 22, Herbie recorded with Kenny Burrell for Blue Note (Freedom, BN-GFX 3057) and was again on the Donald Byrd Up With Donald Byrd Verve session in late October or early November. He appeared on a rejected Wayne Shorter session on November 2, 1964. This rejected session contained a take on “Witch Hunt,” and the players were Shorter, Hancock, Hubbard, Carter and Billy Higgins! 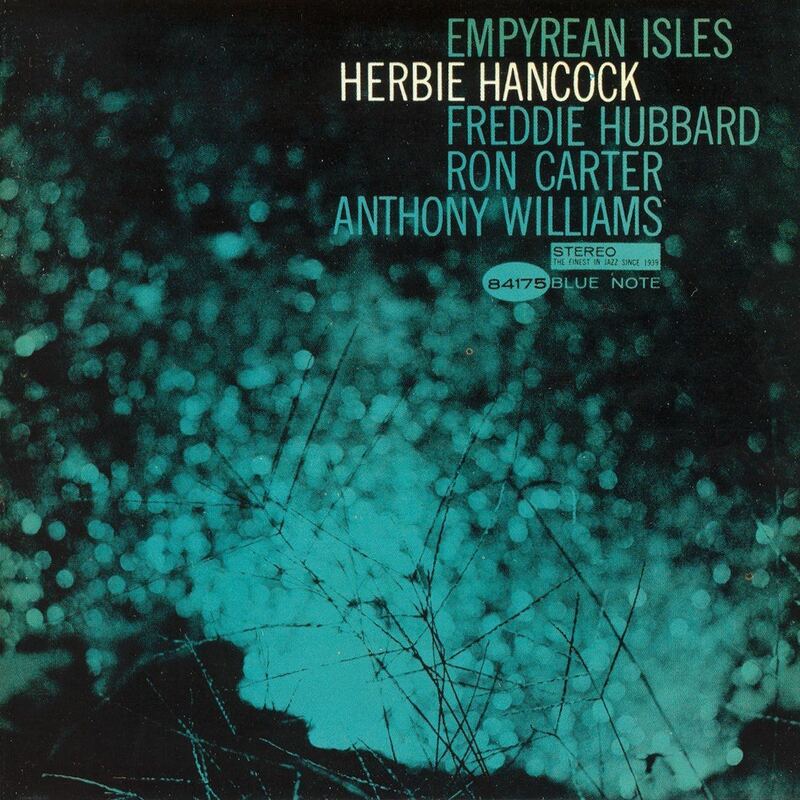 Another Verve session for Byrd (December 16) followed by a Donald Byrd big band session for Blue Note on December 17 and 18 (Donald Byrd’s I’m Tryin’ To Get Home BN-4188) indicated a growing demand for Herbie’s sideman services. On Christmas Eve of 1964, Herbie recorded for Blue Note on Wayne Shorter’s Speak No Evil (BN-4194) with Freddie, Ron and Elvin Jones. 1964 was a great year for Herbie Hancock. No one was surprised at the compatibility displayed by the four musicians featured on this album. At the time, Herbie Hancock, Ron Carter and Tony Williams had worked together for just over a year as members of the Miles Davis quintet. Williams had previously made one of his first recorded appearances on My Point Of View, the excellent (albeit more traditional) sophomore effort by Hancock, which was recorded in March 1963, while Freddie Hubbard and the pianist had demonstrated their affinity even earlier on Hancock’s Takin’ Off and the trumpeter’s Hub Tones (both from 1962). Still, Empyrean Isles was a stunning revelation for most listeners, even those who had been fortunate enough to follow the rapid evolution of the Davis band. Hancock, an inquisitive musician from the outset of his career, had already taken a decidedly experimental turn on his previous Inventions & Dimensions, while documents such as the startling live performances by Davis issued on the Columbia LPs My Funny Valentine and Four And More indicate that the trumpeter’s quintet was already seriously testing the limits of his classic repertoire. Still, there was a conservative cast to the support Hancock received on Inventions, while Davis continued to work within a fixed group of standards and originals that had yet to be expanded via his sidemen’s input. Empyrean Isles was all Hancock’s music and all new. More importantly, it is just about perfect, and remains as eloquent and rewarding as anything else in the estimable discographies of these four great artists. If someone had ordered up a program that explores four distinct areas of jazz expression with equal brilliance, they could have done no better than Empyrean Isles. It is as if Hancock had set out to present “changes,” modal, funk and free playing and delivered each at its apex. “One Finger Snap” is a bracing 20-bar harmonic form, although only the first four bars have a written melody. “Oliloqui Valley” employs shift ing scales over a 28-bar structure (8/4/878), with dramatic tension and release generated by moving between vamp and swing. “Cantaloupe Island” is the blues with a vamp even more infectious and original than the one that powered Hancock’s earlier hit “Watermelon Man,” and the vamp’s retention as an interlude between each solo chorus adds further to the tune’s mystique. This is the recording that US3 sampled for its hit “Cantaloop” three decades later, in what proved to be the biggest-selling recording of all time issued under the Blue Note logo. “The Egg” is an open improvisation that grows from the slightest fragments. Each in its way is definitive. Further revelations were heard when Empyrean Isles was initially reissued on compact disc with alternate takes of “Oliloqui Valley” and “One Finger Snap.” The sequence of the six performances is interesting – first the alternate of “Oliloqui” was cut; then the masters of “One Finger,” “Cantaloupe” and “The Egg”; then the alternate “One Finger” and finally the master of “Oliloqui.” Several listeners, including Bob Belden in his annotation to Herbie Hancock: The Complete Blue Note Sixties Sessions, have ventured the opinion that the alternate “One Finger” is superior to the master. The tenor saxophonist Teodross Avery agrees, and has argued that those of us old enough to have heard the LP first cannot approach the alternate takes with the objectivity of younger listeners who were introduced to all of this music on CD. Avery’s point is worth considering, though my vote still goes to the original “One Finger Snap,” for Hubbard’s blend of aggression and lyricism (his brief solo separating the piano and drum solos is perhaps the finest 16 bars the trumpeter – or cornetist, according to the credits – ever played), the rush of Hancock’s piano improvisation and the glorious detail of Williams’s drum and cymbal sounds. Recorded on June 17, 1964 at the Van Gelder Studio, Englewood Cliffs, New Jersey. Original recording and 1998 remastering by Rudy Van Gelder. Tracks #1-4 originally issued as Blue Note BLP 4175 and BST 84175.